An Arizona Department of Public Safety (AZDPS) trooper acted quickly, pulling the driver from a vehicle moments before it was struck by a passing train. The driver of the vehicle had driven off the roadway and became stuck on the tracks, according to a press release. Henry (Hank) Roanhorse, a northeastern Arizona based trooper, was driving home at the end of his patrol shift when he came across the vehicle stuck on the tracks. Roanhorse was familiar with the area and knew that the tracks carried a large volume of rail traffic, often traveling at high speeds. 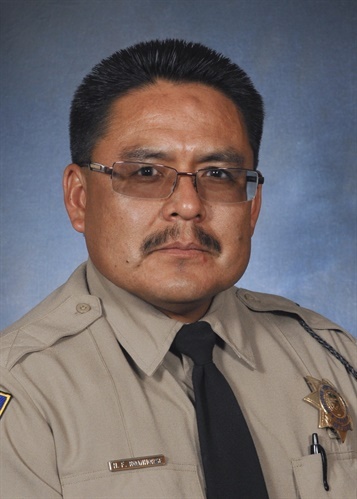 When Trooper Roanhorse approached the vehicle, he found an unresponsive man seat belted and unconscious in the driver’s seat. He also smelled a strong odor of an alcoholic beverage. 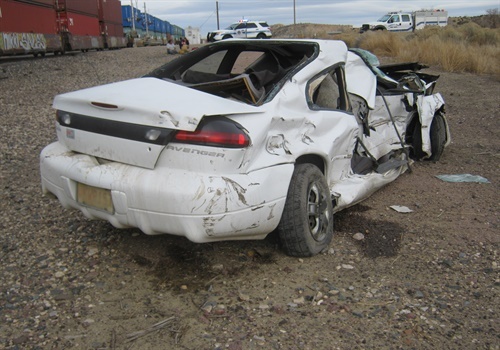 As the trooper crawled into the vehicle to remove the driver’s seat belt, he looked up and saw a BNSF Railway train approaching from around a curve. At the same time, the railroad signal activated and the crossing arms lowered. With a sense of urgency, Roanhorse pulled the unresponsive driver from the vehicle as the train approached. Struggling to carry the nearly 300 lbs. driver, the trooper lowered him to the ground, grabbed him by the feet and pulled him off the tracks. The driver regained consciousness and while unaware of the danger, fought against the trooper the entire time. Trooper Roanhorse pulled the driver about 25 feet away from the tracks before the passing train struck the vehicle. The impact caused the vehicle to travel 150 feet away; it also sustained extensive damage. After the entire ordeal, the man told Trooper Roanhorse, “Thank you officer, you just saved my life.” Roanhorse stated that he just remembered hearing the screeching of the train’s emergency braking in the background as he struggled to remove the driver from the tracks. This incident occurred within McKinley County, NM, just across the Arizona state line, on Defiance Draw Road.